The sizing now goes 4.5,5.5,7,8,9,10,12,14,16 and so the dillema we always had between choosing a 9 or an 11m is now solved with the perfect 10. This is the size we have been kiting with the last month and it really scores 10 out of 10. Boasting unbeatable upwind and top speed the Bandit Dos now has even more precise steering and response. The kite turns only when you want it to and then does it with excellent power and control. At first it seems like the kite might not be turning as fast, but this is only because bar input is so progressive and accurate. We found that the Bandit Dos will keep its power better at any speed of turning as evidenced by its unreal upwind performance. And when you want it to kite loop, your control and response is unprecedented. The kite also feels even more solid and stable in the air thanks to load spreading LE attachments. 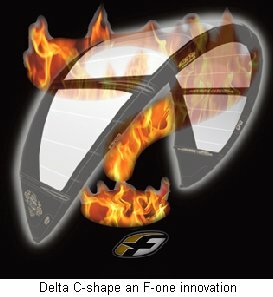 Precise, powerful and intuitive sum up the feeling of the new Bandit Dos kite. Whats new: The construction has been beefed up in all the right places. The struts in particular feature a one peice wrap for most of their length plus scalloped segmenting near the LE. This enhances the force frame feature with even more structural integrity. 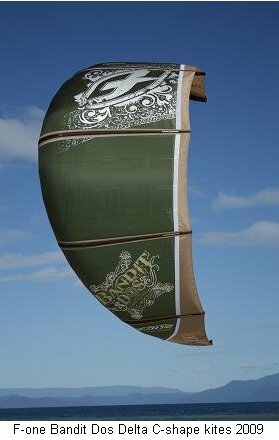 And there is an extra load bearing seam right across the kite which retains and reinforces the force frame but sheds weight particularly in the tips. The EVO (not the ripoff) V lines now have load spreading attachments to the LE, basically an extra pulley and line near the apex. The benefits of this are reduced risk of distortion under extreme loads, and an even smoother depower action. Theres a whole range of new colours and the kite graphics totally rock.